программный аудиопроигрыватель, разработанный Питером Павловским (польск. Peter Pawlowski), разработчиком-фрилансером, ранее работавшим на Nullsoft. Минималистичный интерфейс и высокая производительность программы сочетаются с широкими возможностями и расширяемостью. - поддержка через официальные плагины (в normal и special версиях) форматов MPEG-4 AAC, FLAC, OggFLAC, Monkey's Audio, WavPack, Speex, CDDA, TFMX, SPC, MOD. - Распаковка налету архивов RAR и ZIP. - Низкие требования к системные ресурсам и эффективная работа с большими плейлистами. - Поддержка нескольких плейлистов одновременно. - Высокое качество звука обеспечивается благодаря качественным аудиодекодерам и обработке звука с разрядностью 64бита на всех стадиях (! ), в отличие от обычных 16бит в других плеерах. Это гарантирует качество сигнала даже после обработки многими DSP плагинами (10-полосный эквалайзер, лимитер и пр.). - Поддержка технологии ReplayGain, которая заставляет звучать в этом плеере файлы разного уровня громкости на одном уровне, при этом, что самое важное, не модифицируется сам аудиопоток (в отличие от mp3gain и других подобных, когда происходит определенное ухудшение аудиопотока), а только добавляются определенные тэги. - Расширенная система обработки файлов и тэгов — встроенный masstager, renamer, полная информация о файле. - Умеет копировать аудиопоток с AudioCD и сжимать его на лету во многие форматы, а также проставлять тэги из freedb.org, причем не только к дискам, но и уже к сжатым файлам. А также при установленной программе Nero умеет записивать AudioCD. - База данных аудиофайлов, и плагины для работы с ней — Album List, dbSearch и другие. - Полная поддержка Unicode под NT-системами. - Поддержка плагинов от сторонних производителей. - Поддержка тэгов ID3v1, ID3v2 (в специальной версии), APE2. - Технология ABX-testing (в special версии) — метод слепого тестирования — позволяет достоверное оценить качество звучания различных форматов. - Возможность настраивать внешний вид плейлиста по своему вкусу с помощью простых скриптов и функций. - Поддержка технологии FreeForm (UI), которая реализуется через плагины и полностью меняют интерфейс. foobar2000 is a freeware audio player for Microsoft Windows, iOS and Android developed by Peter Pawłowski. It is known for its highly modular design, breadth of features, and extensive user flexibility in configuration. For example, the user-interface is completely customizable. Its extensive software development kit (SDK) allows third-party developers enough power to completely replace the interface. foobar2000 supports a large number of audio file formats, has many features for organising metadata, files, and folders, and has a converter interface for use with command line encoders. To maximize audio fidelity in cases where resampling or downscaling in bit depth is required, it provides noise shaping and dithering. There are a number of official and third-party components which add many additional features. The core is closed source, whereas the SDK is licensed under the Three-Clause BSD license. 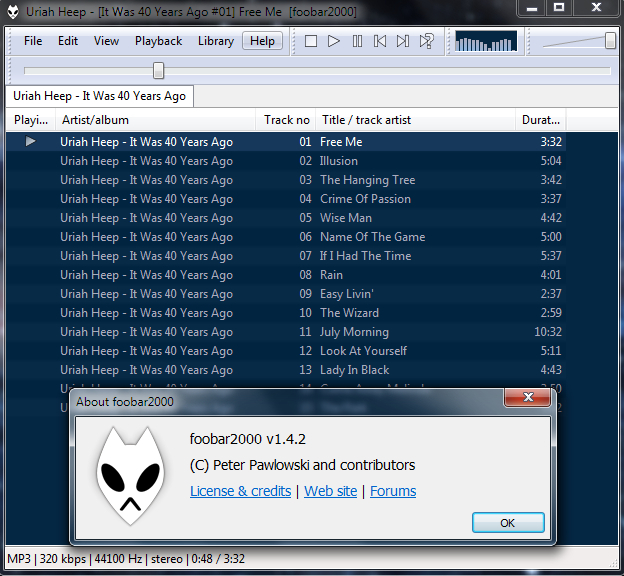 Since version 0.9.5, foobar2000 supports Windows XP SP2/SP3 and later releases only. This version features a revamped default interface, with embedded support for album list, album art, spectrum visualization, and some other features and improvements. In May 2016, versions for mobile devices were released, and in January 2018, an early beta version for macOS was released. ◾Fixed problems with accessing very long file names on network shares. ◾Fixed incorrect display of converter tag transfer option state in the converter setup dialog. ◾Improved compatibility with malformed ID3v2 tags. ◾Added option to prevent hard disk sleep while playing [Advanced Preferences]. ◾Fixed performance issues with Matroska file reading (1.3 regression). ◾Fixed Converter problems with ripping CD to single file with chapters (1.3 regression). ◾Added an option to suppress startup dialog about bad last shutdown. ◾Now using unrar.dll which can be updated easily in the future. ◾Disregard that, unrar.dll is unusable due to bugs and limitations. Now using RAR source directly with own patches, just like previous foobar2000 versions did [beta 4]. ◾Added support for RAR5 format. ◾Updated FFmpeg to 2.4.1 [beta 4]. ◾Updated FLAC code to the latest git (as of 2014-10-07), with bug fixes and speedups [beta 5]. ◾Fixed a very old and very bad Matroska tag writing bug [1.3.4 final]. ◾ New high-quality but slow resampler based on dBpoweramp/SSRC code, as an alternative to fb2k's PPHS resampler. ◾ Prevented clobbering of certain exotic M4A tags. ◾ Smooth scrolling in Default User Interface list controls. ◾ Beta 2: made smooth scrolling disabled by default as it stalls visualisation updates. You can enable it in advanced preferences. ◾ Added missing menu command for the new ReplayGain playback mode. ◾ Added oversampled peak scanning in ReplayGain scanner. ◾ Beta 2: Added tweaks for ReplayGain peak results display, in advanced preferences. ◾ Fixed 96 kHz AAC & ALAC playback. ◾ Added whitelist of HTTPS domains to suppress certificate validity checks on, for home media streaming uses [beta 3]. ◾ Added readable error messages about “Add location” failures [beta 3]. ◾ Improved detection of total duration of Constant Bit Rate (CBR) MP3 files [beta 4]. ◾ More robust recovery from network errors when playing MP3 & AAC internet radio streams [beta 5]. ◾ Removed “LegacyDisable” key in file type associations handling as it's been known to cause problems with modern Windows versions [beta 5]. ◾ Made playback over HTTP automatically retry dropped connections. ◾ New ReplayGain playback mode picking album/track gain depending on current playback order. ◾ Improved handling of malformed AIFF files. ◾ Prevented “Open” etc dialog lockup when last used folder is on a nonworking net share referenced by raw IP. ◾ Fixed FLAC seeking regression from the previous version. ◾ Added support for MP4 DASH files. ◾ Fixed PPHS resampler crash on extreme sample rates. ◾ Fixed missing WavPack mime type handler. ◾ Improved DirectSound output behaviors with low-latency configurations (mainly for new ABX Comparator). ◾ Updated libFLAC to 1.3.1, fixing known security issues. ◾ Fixed deadlock when encountering an incomplete multi-part RAR file. ◾ Internal changes for the upcoming ABX component update. ◾ Fixed inconsistent capitalization of some menu items. ◾ Fixed dBpoweramp/SSRC resampler glitching in extreme upsampling cases. ◾ Fixed misbehavior of FFmpeg -strict level override option. ◾ Writing of SoundCheck tags [experimental] as well as batch copying ReplayGain to SoundCheck. ◾ Fixed “Remove tags” not removing every possible tag type with FLAC and M4A formats. ◾ Fixed Properties dialog locking up on certain metadata. ◾ Made cuesheet & chapter edit operations automatically update affected playlists. ◾ Fixed Ctrl+A in various multiline editboxes, Properties dialog and its sub-dialogs in particular. ◾ Improved compatibility with certain malformed M4A files. ◾ Fixed Equalizer bug causing inconsistent file lengths when batch converting. ◾ Made internet radio streams disconnect/reconnect on pause/unpause. ◾ Implemented updated Opus ReplayGain specification. ◾ Improved properties dialog info display of Opus files. ◾ Fixed a random crash regression from 1.3.10. ◾ Fixed reading of Apple gapless information from specific old M4A files. ◾ Fixed a rare lockup when batch moving/renaming/copying a lot of files. ◾ Updated FFmpeg to 3.1.2. ◾ Fixed writing of empty ID3v2 tags when attempting to remove all attached pictures from files that do not have an ID3v2 tag yet. ◾ Added handling of M4A tag “Conductor” metadata value. ◾ Fixed crash on too long URLs. ◾ Fixed reading of iTunes “compilation” flag from ID3v2.2 tags as written by default by iTunes. ◾ Added support for raw AAC files with ID3v2 tags. Note that use of raw AAC format is discouraged, please use MP4/M4A instead. ◾ “Add Folder” now accepts multiple selected folders if running Windows Vista or newer. ◾ Worked around spurious context menu items in Windows Explorer. ◾ Reverted all shell integration fixes from 1.3.9 and 1.3.10 beta 1. They broke more than they fixed while attempting to work-around an obvious bug in Windows 10. ◾ Added an advanced preferences option to override FFmpeg -strict level to allow standard-compliant 7.1 AAC decoding. ◾ Added an advanced preferences option to disable media key event processing. ◾ Corrected crashing on certain malformed RAR files. ◾ Corrected various 1.3.11 pause regressions. ◾ Corrected “remove tags” on MP4/M4A files incorrectly showing that the file still has some metadata immediately after the removal. ◾ Flat equalizer now produces bit identical stream. ◾ Prevented clobbering of iTunes “Encoding Params” tag on MP4/M4A tag update. ◾ Now using WavPack5 decoder with support for files larger than 4 gigabytes. ◾ Updated ZIP archive reader now supports ZIP files larger than 4 gigabytes. ◾ Added support for Matroska/ALAC files. ◾ Fixed multichannel ALAC channel order bugs. ◾ Fixed multichannel WavPack in Matroska. ◾ Improved handling of various malformed files (Matroska, AAC). ◾ Made files with extreme sample rates (>200KHz) playable through standard DirectSound output, resampler activated automatically if needed. ◾ FLAC “Remove tags” no longer erases the “tool” field. ◾ Reverted 1.3.11 FLAC tag updater tweaks. Removal of padding will be added as a separate feature later. ◾ Improved compatibility with certain internet radio stations. ◾ When editing tags of iTunes-encoded M4A files, excess padding (often as much as 32 kilobytes) will be removed. ◾ Better handling of WMA “rating” field. ◾ Default UI album art viewer now less likely to make app unresponsive when attempting to load pictures from a lagging network share. ◾ Embedded album art loading performance tweaks. ◾ Unicode filenames within ZIP files now work correctly. ◾ Added “skip all” button to Converter overwrite prompt dialog. ◾ Fixed resampler configuration sample rate pickers not allowing more than five digits. ◾ Fixed bugs with conversion to multitrack (chained streams) Opus. ◾ Fixed a glitch in plaintext library/playlist search query handling. ◾ Various cosmetic fixes for high DPI screens. ◾ File Operations component updated: smarter file delete feature, with options in advanced settings. ◾ Corrected 1.3.12 regression causing certain DSP configurations to crash. ◾ New utility commands to optimize file layout & minimize file size. ◾ Updated FFmpeg to 3.1.4. ◾ M4A file format compatibility fixes. ◾ Enabled WavPack 5 DSD decoding. ◾ Fixed a bug in Converter causing conversion to a root folder of a drive to occasionally fail. Converter: advanced-preferences option to encode to temp folder and move encoded-and-tagged files to the intended destination. Converter with “don't reset DSP between tracks” now respects DSP-reported latency for proper handling of gapless albums.